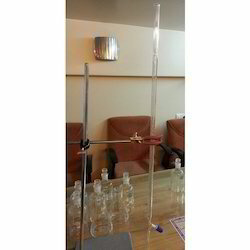 Coordinating with the various advancements taking place in the industry, we are involved in providing a range of Laboratory Glass Burette. - Motor Controlled piston movement. - Re-circulation system allows quick purging without loss of reagent. - Easy, user-friendly, TFT touchscreen guides you to perform quick and accurate titration. - Three dispensing speeds including drop-wise dispensing allows you to achieve the end point very accurately. “Teknik Burette Automatic Zero, mounted on Reservoir with Screw type PTFE Rotaflow Needle Valve stopcock And rubber bellow. 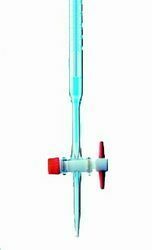 This Burette has a transparent acrylic body and a leakproof stopcock fitted with a self lubricating PTFE plug. Each Burette is individually calibrated to give maximum accuacy. Acrylic body is unaffected by dilute mineral acids & bases except Hydrofloric Acid & Ammonium Hydroxide. The pH RANGE OF 1-14 is ideal and can be used up to 5% wt/wt of acids or 30% bases. We are counted amongst reckoned names in the industry, committed towards offering a wide gamut of Laboratory Burettes.